Beautiful letter written by a father to his son and daughter. all of us, young or old, children or parents.! lives. Some words are better said early. you. You have to be careful, don't hastily regard him as a real friend. riches, but one has to start from some rags! understand this, you would end up with unnecessary troubles. Once upon a time there lived a King, who despite his luxurious lifestyle, was neither happy nor content. One day, the King came upon a servant who was singing happily while he worked. unhappy and gloomy, while a lowly servant had so much joy in his heart? The man replied, "Your Majesty, I am nothing but a servant, but my family and I don't need too much - just a roof over our heads and warm food to fill our tummies." Later in the day, the King sought the advice of his most trusted advisor. After hearing the King's woes and the servant's story, the advisor said, "Your Majesty, I believe that the servant has not been made part of The 99 Club." "The 99 Club? And what exactly is that?" the King inquired. The advisor replied, "Your Majesty, to truly know what The 99 Club is, place 99 Gold coins in a bag and leave it at this servant's doorstep." When the servant saw the bag, he took it into his house. 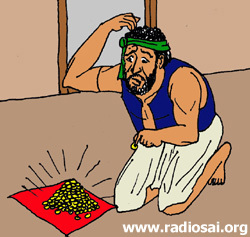 When he opened the bag, he let out a great shout of joy... so many gold coins! He began to count them. After several counts, he was at last convinced that there were 99 coins. He wondered, "What could've happened to that last gold coin? Surely, no one would leave 99 coins!" He looked everywhere he could, but that final coin was elusive. From that day, the servant's life was changed. He was overworked, horribly grumpy, and castigated his family for not helping him make that 100th gold coin. He stopped singing while he worked. Witnessing this drastic transformation, the King was puzzled. When he sought his advisor's help, the advisor said, "Your Majesty, the servant has now officially joined The 99 Club." He continued, "The 99 Club is a name given to those people who have enough to be happy but are never contented, because they're always yearning and striving for that extra 1 to round it out to 100! "Everyone is trying to accomplish something big, not realizing that life is made up of little things." A thread with 16 knots, dipped in turmeric, (Haldi) is kept on the betel leaf and worshipped with the idol of Gowri. After pooja , the custom is that they give “ maradha baagina” to suhaasinis. On this day, Hindu women and young girts are in new/grand traditional attire. They make either jalagauri or arishinadagauri (a symbolic idol of Gowri made of turmeric) and bestow her for Puja. These days ready-made beautifully painted and decorated clay idols of Goddess Gowri can be bought along with Ganesha statues, at the local market. The goddess’ idol is mounted in a plate, with a cereal (rice or wheat) in it. According to the Vrata, Asthis pooje is to be performed with 'suchi' (cleanliness) and 'shraddhe' (dedication). A mantapa, generally decorated with banana stem and mango leaves, is built around the idol. The Gauri is decorated with decorations made of cotton, vastra(silk cloth/saree), flowers garlands, and ladies get their 'gauridaara' (a sacred thread with 16 knots ) tied to their right wrists, as blessings of gauri and as part of the vratha. At least 5 baginas are prepared as part of the vratha. The name Varalakshmi itself can be interpreted in two ways.In one meaning, Varalakshmi is one who grants boons (Vara/Varam). In another, she is the Goddess who is invited into the home and honoured.One who performs this pooja with great devotion and bhakti is believed to be blessed with dhanam (money), dhanyam (grains or food), arogyam (health), sampath (property), sathsanthanam (virtuous offspring) and "dheerga saumangalyam" (longevity of the husband). Performing the Varalakshmi puja is said to be equivalent to worshipping all the different forms of Lakshmi. Varalakshmi vratam is considered auspicious for a married women. This vratam is also known as sravana sukravaram vratam. The legend behind Varalakshmi puja and the vratam is fascinating. It was a game of dice which caused a small tiff between Lord Shiva and Parvati as to who was the victor. An honest gana, Chitranemi, was asked to arbitrate and he decided in Shiva's favour. An angry Parvati cursed him to suffer from leprosy. When Shiva pleaded with her, she gave in and said the day women in the world observed Varalakshmi puja, Chitranemi would get deliverance. Chitranemi got relief when he observed some women performing the puja. Ever since then, this vratham has been observed. For the katha (Story), Click the link below . 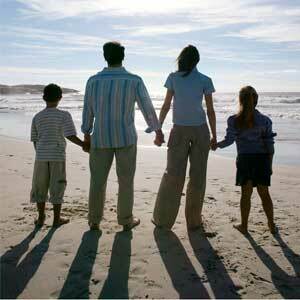 In the year 2010, Shravana Masam starts from August 11 and ends on September 8th. Shravana masa is the most important month to perform Lakshmi pujas. This month is considered very auspicious and numerous festivals are held in this month. I will be posting rituals related to these festivals here accordingly. Mondays of Sravana Masam is dedicated to Lord Shiva. Mangala Gowri Vrata is observed on Tuesdays in the month of Sravana by women. Fridays in Shravana sukravaram is dedicated to Goddess Lakshimi. Saturdays are dedicated to Lord Shani and Lord Balaji. The birthday of Lord Krishna is observed in the month and therefore many people consider the month highly auspicious and perform numerous functions like Grihpravesh etc. Shravan Poornima is observed as Raksha Bandhan. Note: one can post slokas or any related information in the comment section , so that it will be useful for all of us to learn something new. This is my first pooja/Vrata after marriage, I came to know about this vrata from my Mother In Law. Before performing this pooja, I wanted to collect some information to be handy, such as stories and audio links, since books based on these poojas are not readily available in US. So, thinking that this info would be helpful to both me and my MIL, I have collected information about the significance of this pooja and katha (story) to be read on this day by sumangalis, along with the rituals, so that every year it wouldn't be a hassle to search for the procedure of this vrata. Bhimana Amavase known as gandana pooje or divasi gowri pooje or jyothi bheemeswara pooja is a very important festivals performed in karnataka. Its generally observed on Ammavasya, no moon day, in the month of Ashada (July – August). This time it is on Aug 10th 2010. It is the last day of the month of Aashada. 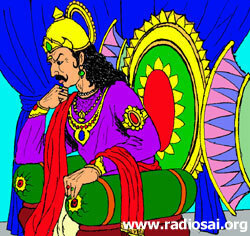 Ashadaa Bahula 30th tithi is called Deevasi (Amavasye). Since the importance of this festival is to mainly worship Lamps, its otherwise known as JyothiBheemeshwara amavasi. It is believed that AshtA vidha Lakshmi seem to visit houses glittering with Lamps. Lighening Lampsmeans the emission of SadguNa as Aradhana. 1)Clean the pooja place, put rangoli, on which they place a wooden plank (Peeta/mane). 2)On this wooden plank, place a silver plate with raw rice and place 2 lamps (Mud lamps or silver lamps) along with divasi gowri or mangala gowri idol. 3) Near to it, keep 9 betel nuts, 9 betel leaves and a thread and 1 dry coconut. 4) For neivedyam, a special dish is prepared kucchida kadubu / steamed cakes(kannada) with wheat or rice flour. Shalabaranam kala deepika - maadi; Naaru batti neeru ennai nerudhalu. 7) Finally a sacred thread is tied on their right hand wrist by another brahmin woman or by Mother in law. They offer prayer to God that their house may glitter with happiness and prosperity, peace, like the Lamp. on Bheemana amavasya Day. And what is the story behind the festival. A set of Saints (Rishis) were living in “Namishaaranya”. They were termed as “Shaunakaadhi Mahaa Muni”. Once Sootha PuraaNika saint came to them as a guest. These rishis questioned him to tell them as to which type of Vratha should ladies perform so that they could get “ Dheerga Sunmangalithwa, happiness, wealth, good husband, etc. would be a great boon, apt, as well as in the interest of to the ladies to perform the Vratha. Pathi Sanjeevini Vratha , performed on Ashaada maasa Krishna Paksha Amaavasya day. Saurashtra kingdom was ruled by Vajra Baahu. He was a great warrior,powerful and intelligent. He had a son called Jayasheel. He was handsome and had all the good qualities. But passed away at a young age.It was a great set back for the Raja. “pitrus” would get “ sadgathi”. He sent word that anyone who would marry his dead son would be given lot of money ,wealth etc. A drummer used to go round cities with his drum , make sound loudly and announce the proclamation made by his king. People listened and nobody was prepared to accept the condition. 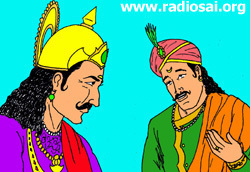 Listening to the drum beat, he thought that he could give one of his daughter to the king. He was in a state of confusion and was thinking as to how open the discussion with his wife. He was walking up and down in the house. marriage with the dead Yuvaraaja for the sake of money. The Raja, felt happy that his wish came true. The poor man came to his village with a lakh of rupee and wealth. prayer to God, she lit the pyre. Oh! It was a miracle. Immediately rain came and puts of the fire. The sun disappeared in the west. . The rain was so furious that water gushed everywhere. Pitch darkness prevailed. In such a situation the king left to his palace, leaving the dead body and the daughter in law in the hands of cruel animals, demons, witches. without leaving the dead body on the pyre. She was afraid, to be alone in that place. She offered prayer to God. Swaadha devi became Sumanagalis and got children,. She requests god as to why she should be punished for no fault of hers. She requests the almighty to protect her. what she wants. She prays god to give her SauBhaagya samapaththu. getting the SauBhaagya Sampath there is an auspicious Vratha. In Ashada maasa Krishna Paksha Amavaasya day, the lady is supposed to have Managala Snaana. The Pooja room is decorated with mango Leaves, flowers and with Rangavalli. Rice is spread on the Peeta or a plate. Lord Eshwar is there. He is present in that form. Among Ashta murthy, his friend Chandra is also there. The Jothirmaya is named as BHEEMESHWARA. This is the Pooja Vidhaana or Krama narrated by Eshwar and he disappears. She took bath in the river and molded two lamps and rolled out fiber of a plant to form the wick for the lamps. She poured water into the lamps and also remembered bandara and instead of the wheat / rice steamed cakes, she made mud balls representing bandara. Lord Shiva and Parvathi were watching all her activities and were extremely pleased with her devotion and blessed her with all their energy. The girl lighted the lamps with water and performed the pooja using wild flowers/grass as flowers and leaves. As she finished her pooja Lord Shiva and Parvathi appeared before her. Lord Shiva broke the mud balls / bandara/ Kadubu and asked her to ask for a boon. She requested them to bring her husband back to life, which was granted. Immediately there was a change and she was encircled with a fort with many attendants around her. Her husband sleeping on a cot gets up as if he was waking from sleep. He listens to the story narrated by his wife. The king having heard this comes rushing and embracing his son and appreciating the perseverance and devotion of his daughter in law praises her and brings them to his kingdom and they live happily there afterwards. This is the story told by Sootha PuraaNik to Shaunakaadis in Skaanda PuraaNa. This blog is all about the things that we cherish in our day to day life..It can be Food, Music, Articles, Festivals,Health and lot more. So don't just stick to one thing...move on!! !